The Professional Regulation Commission (PRC) on Wednesday, May 7, 2014 released the complete list of passers for May 2014 Civil Engineer board exam. 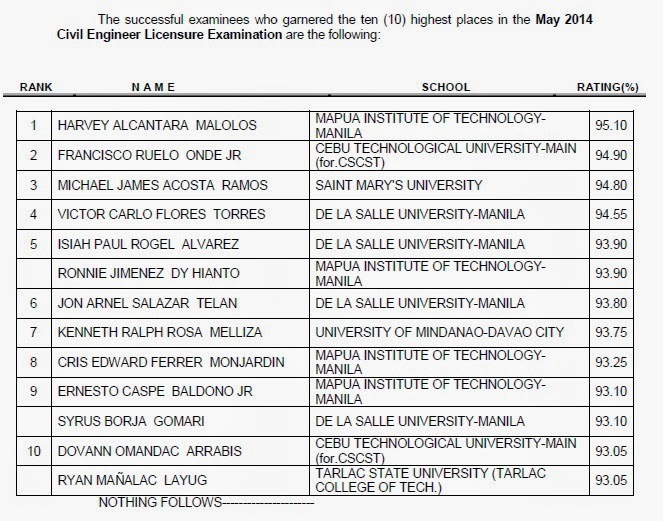 Harvey Alcantara Malolos of Mapua Institute of Technology (MIT)- Manila topped the board with 95.10 percent grade. Cebu Technological University (CTU) graduate Francisco Ruelo Onde Jr. ranked second with 94.90 percent average grade.